Tech entrepreneurs, social agents, and creatives all coexist in San Francisco. As one may expect, the busy city is full of coworking spaces for ideas to develop and collaborations to grow. San Francisco is an eclectic location with different industries and income ranges, so not all coworking spaces are built the same. To decide whether or not a place is for you, consider factors such as membership fees, amenities, location, and culture. Since prices in San Francisco can be steep, your budget is a good place to start when you weigh whether or not a spot’s amenities and locations are worth it. Based on your profession and goals, culture is also important for making connections and feeling like you’re part of a community. You can glean information from official websites as well as request tours or day passes before you reach for you make a commitment. 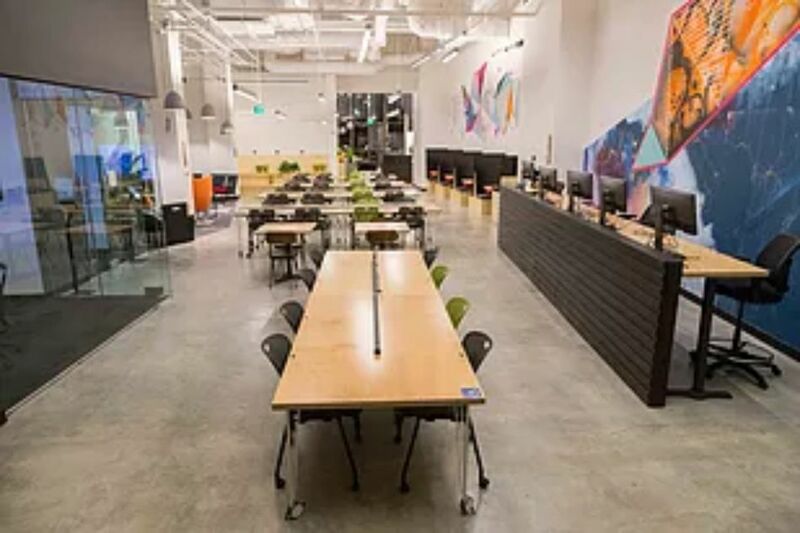 From tech-devoted campuses to social impact centers, we compiled a list of the best coworking spaces in San Francisco that will suit entrepreneurial teams and freelancers alike. Workshop Cafe is a comfortable, low-key space for getting work done, taking advantage of tech services, and eating delicious food. You will find the Workshop Cafe in both San Francisco's Financial District and SoMa neighborhood. Like a few other Bay Area coworking spaces, patrons pay by the hour at Workshop Cafe. The prices are reasonable depending on the length that you stay and the number of people on your team, from $3.50 an hour for a regular desk to $60 per hour for a 10-person conference room. Because this is San Francisco, you can, of course, book a space on Workshop Cafe’s app, which will also allow you to order snacks and meals onsite. The team features a select handful of restaurateurs, so there is plenty of freshly made food and drinks to go around every day, such as coffee, shakes, parfaits, breakfast bowls, wraps, snacks, and so on. However, you do have to pay separately from your reserved seating fee. The amenities at the Workshop Cafe are printing and scanning services, private rooms, diverse seating, flexible hours, and fast Wi-Fi. Women's coworking spaces are a rising trend in the industry, offering women a professional community to grow and collaborate together. The Hivery is one of the most popular ones in the San Francisco Bay Area. It's technically located in Mill Valley, which is just 14 miles north of the city of San Francisco. The Hivery has a bright and open space, the perfect hub for business entrepreneurs, freelancers, and those exploring a new field. People know it for its inclusive culture, as well as its events that emphasize wellness, networking, and career skills. Membership perks vary, depending on your package. Coworking subscriptions start at $295 for eight days per month while unlimited access cost $395 per month. Coworking members receive amenities such as program invitations, tech equipment, conference and multipurpose rooms, drinks and snacks, storage options, and an atrium work café. Since many startups reside in San Francisco, you will find specialized coworking spaces throughout the city. If you do not mind working at a chain coworking site, WeWork is excellent for convenience and accessibility to a variety of programs and networks — there are currently 11 locations in the metro area with a few more announced. As San Francisco is a major hub for tech and finance, WeWork membership will allow you to connect with clients and investors all throughout the city. You will have access to any WeWork spot once you subscribe to its services. WeWork offers many amenities such as speedy Internet, IT support, daily cleaning, office supplies, 24/7 access, office supplies, printers, and mail services. For drink lovers, there's also craft on draft and micro-roasted coffee. The subscription prices are a few of the most affordable in the city, which is known for its high costs. Hot desks cost start at $190 per month, while private offices start at $450. Retail-tech entrepreneurs will delight in Bespoke, a coworking space located in the heart of downtown San Francisco. Housing both startups and big brands, it sits at the very top of the popular Westfield Mall, which is home to over 200 shops and eateries. Amenities include 24/7 workspace access, Wi-Fi, conference rooms, and consumer-facing pop-up shops. Some of Bespoke’s more unique perks are a rock climbing wall and a napping nook with blankets and pillows. Shared desks start at $404 per month whereas dedicated ones cost $625 per month. Besides functioning as a coworking space, it also boasts workshops, demos, and events. World-renowned designer Yves Béhar mapped out Canopy, so its design is a true masterpiece. It is more or less a luxury club for powerhouse entrepreneurs with deep pockets, flaunting state of the art furniture and goods. Canopy is full of luxurious setups, boasting a kitchen with Heath Ceramic tiles, ergonomic Herman Miller chairs, complimentary coffee, and ​Juicero juice presses. Some of its business perks are HD video conferencing, Internet, printing services, mail services, tech support, and desk phones. Canopy also hosts cultural programming throughout the year, like talks, presentations, and debates. "Nomad" subscriptions allow you to visit 60 days out of the year for $275 per month. For a shared table, you choose ten days out of the month for $365. Of all the prices, the virtual office option is the most affordable at $100 per month for a ready-made address and mailing service. The coworking space's three locations in San Francisco include Pacific Heights, Jackson Square, and an upcoming space in the Financial District. If you are working on art full-time, finding a space in San Francisco at an affordable price can be difficult. Situated in Dogpatch, the Minnesota Street Project is an affordable solution that costs less than market prices for art spaces, consisting of three warehouses on, as its name implies, Minnesota Street. It offers shared and individual studios with resources like wood shops and print shops. It also creates plenty of opportunities for collaborations with galleries, curators, and collectors. The application for the studio space is competitive, so Minnesota Street Project is best for artists in the middle of their full-time career. Besides artists, the coworking project houses several nonprofits and art galleries. It is also home to annual events like the San Francisco Art Book Fair. Inside its 1275 location, there is an atrium with bleacher seating and free Internet for public use. As a coworking space, Covo emphasizes wellness and community. It's located in one of San Francisco's most bustling districts in SoMa, where there is plenty of art and culture around shops, museums, eateries, galleries, and more. In terms of drinks and dining, subscribers get access to a coffee shop, full-service cafe, and taprooms. Depending on your membership, there are generous business amenities, including daily cleaning services, 24/7 access, mail services, member events, phone booths, meeting rooms, and printing services. Since the culture at Covo is big on wellness, the coworking space also offers perks like dry cleaning, day lockers, nap rooms, bicycle rooms, and, interestingly, futuristic toilets. The prices can get steep. Hourly coworking costs $4 an hour, whereas open seating costs $419 a month. Your first day, however, is free, so you will be able to test out the waters before financially committing to a membership fee. Impact Hub is the gathering spot for social change agents who are devoted to causes like student success and sustainable apparel. It connects local entrepreneurs and offers impact-driven programming and events. Impact Hub has three branches throughout the Bay Area in Berkeley, San Francisco, and Oakland. The San Francisco location has 25,000 square feet devoted to rooms and spaces for miscellaneous business needs. There, dedicated desk and private office members receive perks such as meeting room access, privacy booths, event space, nursing rooms, showers, bike storage, printing and scanning, coffee and tea, and office supplies. Individuals can pay $225 on a monthly basis for Monday through Friday access and discounts on programming, rooms, and lockers. The premium individual membership costs $375 per month and includes 24/7 access on top of savings. Dedicated desks and offices start at $800 per month.